Sam, Alice and Paige attended vacation bible school at our church this past week. They sang, danced, snacked, worshipped, crafted and generally enjoyed themselves all week. I thoroughly enjoyed my alone time…I ran, hiked, enjoyed chai’s, shopped and had a great week! Sorry, Laura, but somebody had to do it! 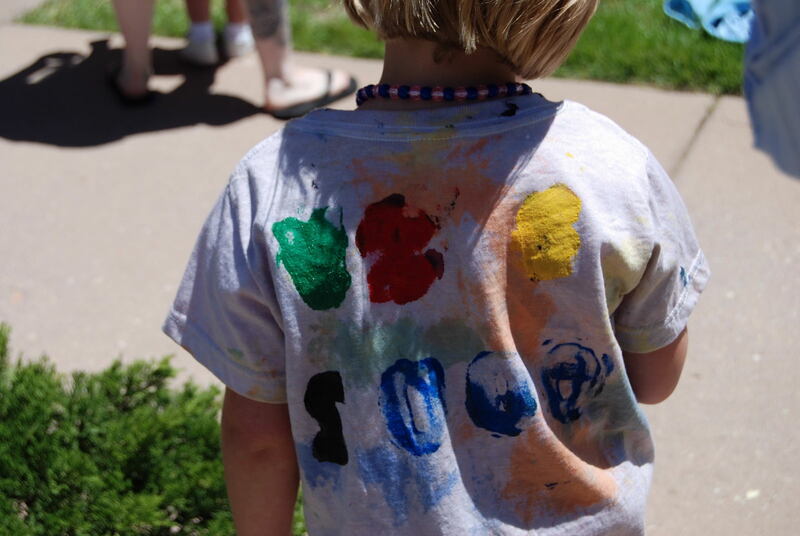 One of the VBS crafts was Tye-dying t-shirts. The kids stamped VBS 2008 on the back and wore them for the performance on the last day where they sang a couple songs for all the parents. Afterwards, the church served a picnic lunch. As you can see from the pictures, my kids definitely loved the dessert…Popsicles. Paige was a little unsure about my leaving every morning but warmed up quickly and had a blast. She had great teachers that kept her engaged (distracted) as I left. Singing was her favorite part of VBS! That did not surprise me. Enjoy the pics!! Sorry I complained all week. I am glad the kids had fun. But I am also glad it is only once a year!